In what could probably be categorized as an unfair fight, GTBOARD.com pitted two potent Porsches against each other. The lucky cinematographer is riding shotgun in a new 911 GT3 RS. The current 991 series arrives with a 4.0L flat six making 500 hp without forced induction. We’re not sure how they are able to make that much power without a turbo, but it might have something to do with the almost 9,000 rpm redline. We have a 2016 example in Lava Orange in our showroom, and we can attest to its attributes. The argent opponent is an incredibly rare 997 generation GT2 RS. Rumored to be a response to Nissan’s GT-R lap times at the ‘Ring, Porsche pulled a 3.6-liter twin turbo race engine out of mothballs to set a new track record. Power was rated at 620 with 516 lb-ft of torque. With a window sticker hovering around a quarter million dollars, only a handful made it to the US. In the hands of a competent driver, the six-speed manual can be just as competitive as the late model PDK, and much more rewarding to drive. Carroll Shelby said it best: Horsepower sells cars, torque wins races. 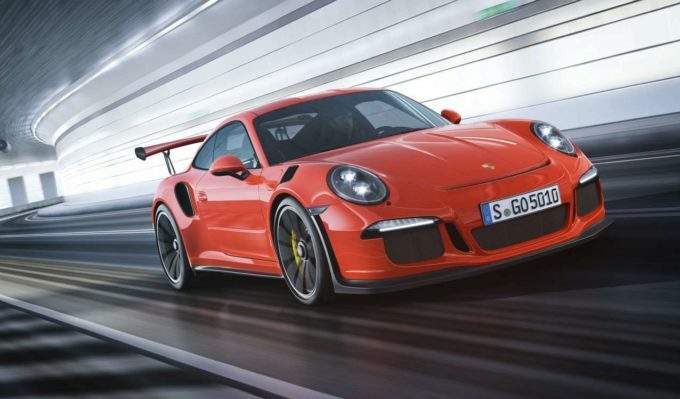 The new GT3 RS may rev to the moon, but it only offers 338 lb-ft of torque. Watch below for a perfect example of this in action.